I received three different faucet face water bottles. Each has it’s own little saying or design on it. The bottles are each made of glass instead of plastic. The lids on the bottles are plastic twist on lids. The lid colors go with the color on the design of the bottles. 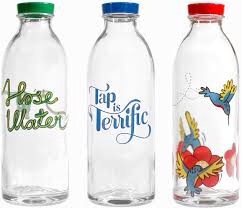 I love these glass water bottles. I think that they make the water just taste a little bit better.